Deputy PM, FM Pham Binh Minh said Viet Nam will continue close coordination with Japan to further advance the ASEAN-Japan relations in an effective and practical manner. 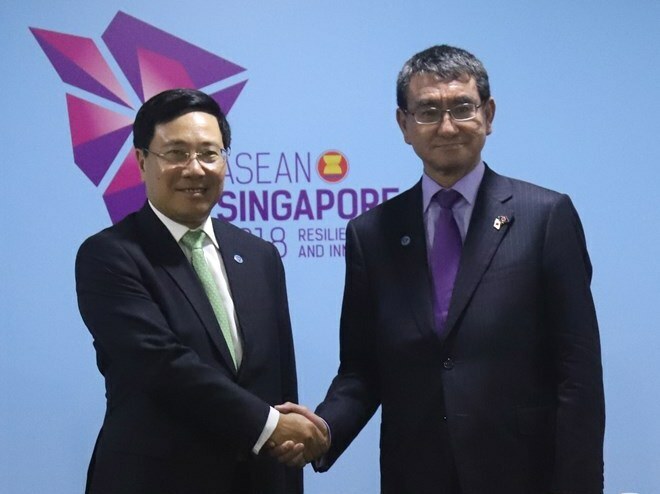 Minh stressed the point during his meeting with Japanese FM Taro Kono on the sidelines of the ongoing ASEAN Foreign Ministers’ Meeting in Singapore on Thursday. Viet Nam assumed the role as the country coordinator of the ASEAN-Japan Dialogue Partnership since August this year. The pair agreed that the two sides will continue working together to realize the outcomes of the recent high-level visits, including the Japan visit by State President Tran Dai Quang. Meanwhile, Japanese FM Kono expressed his belief that the Mekong-Japan Summit, scheduled to take place in Japan in October this year, will help strengthen connectivity and people-to-people exchanges in the region. Regarding regional issues, the two sides shared concerns over the complex developments in the East Sea, emphasizing the importance of maintaining peace, stability, security, safety and freedom of navigation and aviation in the East Sea as well as denuclearization process of the Korean peninsula. The same day, Deputy PM, FM Minh also met with Iranian FM Javad Zarif. Minh affirmed Viet Nam really attaches importance to the traditional friendship with Iran, suggesting the two countries coordinate closely in realizing the outcomes of their leaders’ recent visits. He also asked the Iranian side to create more favorable conditions for Vietnamese businesses, including Viettel and Petro Viet Nam to do business in the country. Both sides agreed to foster cooperation in such fields like energy and banking in a bid to soon raise the bilateral trade value to US$2 billion. Earlier the same day, Minh had bilateral meetings with Cambodian FM Prak Sokhonn and Norwegian FM Eriksen Soreide./.